Are you ready to fall in love? The Delightfully Detailed Suite is one of those suites that has so much to offer! You’ve seen me using the Delightfully Detailed Laser-Cut Specialty Paper in THIS POST, and share the details of this gorgeous paper. In that post, I also used the Delightfully Detailed Note Cards & Envelopes for that project. But there’s so much more to this suite of products – let’s have a look! The Delightfully Detailed Note Cards & Envelopes coordinate perfectly with the size of the Delightfully Detailed Laser-Cut smaller panels. Of course you can also combine these panels with the Memories & More Card Pack! I wasn’t kidding when I said this suite has so much to offer! But wait – I’m not done yet! There’s the gorgeous Faceted Dots; you get a total of 96 pieces in the 3 different sizes and 4 colours – Basic Black, Blackberry Bliss, Grapefruit Grove and Mint Macaron. Then there’s the 5/8″ Polka Dot Tulle Ribbon, available in both Whisper White and Very Vanilla. But don’t limit yourself to those 2 colours! Use our Stampin’ Spritzers and any colour re-inker to create the perfect coordinating ribbon for your project! You can also spritz the Laser-Cut paper with the Spritzer and re-inkers. NOTE: I suggest combining the re-inker with rubbing alcohol instead of water; it will dry faster, and not ‘soak’ the delicate paper. Stampin’ Up! has put together a short video, sharing how to use the Detailed Trio Punch. It also shows off the different pieces of the Suite, in completed projects. Have a look! 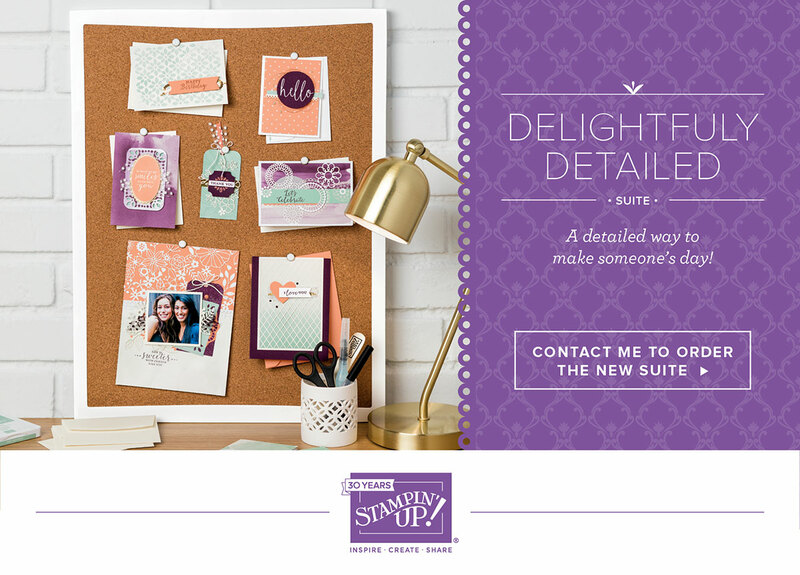 ORDER YOUR DELIGHTFULLY DETAILED SUITE PRODUCTS TODAY! Get creating! Order the whole suite, or just the products you want now. Click on the product images below to order through my online store. It’s open 24/7, so shop when it’s convenient for you! 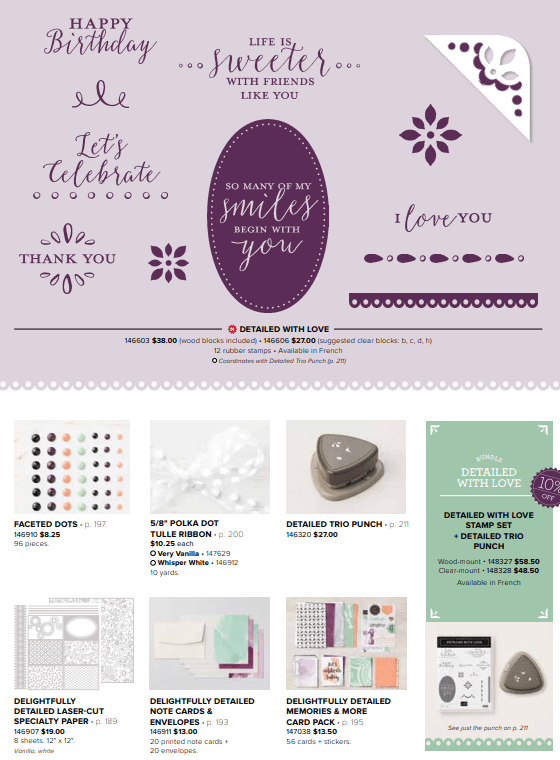 Remember that when your order reaches $200, you instantly qualify for 10% in Stampin’ Rewards – that’s an extra $20 in FREE PRODUCT of your choice!